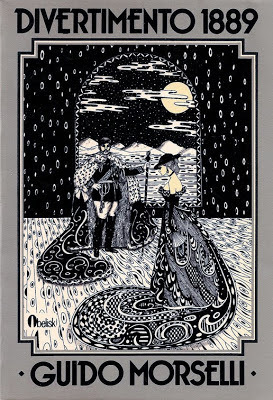 In an afterward to Divertimento 1889 (published 1975), Italian author Guido Morselli transparently defines his short novel: “A simple story with no special significance, and with nothing to teach…a flight from reality among the phantoms of the Belle Époque? I would not deny it.” But Morselli’s deceptive modesty here is but one reason the author remained largely in the shadows until after his suicide in 1973, after which publication of his works brought recognition that Italy had lost one of its finest writers. As even the title of this novella suggests, Divertimento 1889 appears to be escapist fiction. This is not entirely true. Rather, it’s escapist fiction that thematically examines the very idea of escape, written with a pregnant, tensile evanescence, like a shining soap bubble maintaining itself longer than one would think possible, and hinting at ineffable presentiments beyond its blithe, fairy-tale-like gaiety. No mysterious allusions, no dark presentiments. He is far too sure of his fate. Some fine dramatic death, all over in a flash? No chance. His destiny is very different, and far worse. This futile slavish job of his, condemned to trail the length and breadth of his ungrateful land - dusty, disjointed Italy - with no power and no responsibilities and yet pursued everywhere by papers and couriers, as though it all depended on him, as though he could alter a thing. Morselli, who wrote an entire allohistorical novel about World War I, toys here with history on a smaller scale, inventing an episode missing from the actual accounts of Umberto’s reign: the king, on a whim, trades his mountains of paper for the mountains of Switzerland, and goes off on a secret escapade. Adopting the pseudonym Count Filiberto di Moriana and taking along a small coterie of trusted advisors, Umberto decamps to the Hotel Adler in Groeschenen. The sale of one of the King’s landholdings to Frau Von Goltz of nearby Wassen, aunt to a member of the King’s entourage, will serve as partial excuse for his presence. “Hunting,” whereabouts unknown, will serve as partial excuse for his absence. Handing over your money, pocketing the change, behaving like other people do so enviably every day…He bought stamps, and postcards which he would never send, chocolate he would never eat because it was against doctor’s orders, a half-bottle of Kirsch which he presented to Mancuso, exactly like a real-life tourist who has to count every Swiss franc he spends. For then travel by train was a thrill which the railways companies fostered by devising ingenious circuitous routes, spectacular ascents and descents and contortions, fruit of a technology full of fantasy which, like the opera-house, prized set design and trompe-l’oeil effects purely for their own sakes. A variety of spectacles was available to the village’s summer guests. There was the to-ing and fro-ing of the more dauntless among them, Anglo-Saxon for the most part, setting off to scale the glaciers with a tinkling arsenal of crampons, ice-picks, and Alpenstocks, amid a picturesque retinue of guides and muleteers and porters, and as like as not returning with broken bones and half frozen to death. The French (or French-Swiss, or Belgians) were bandying impressions of Italy. They had been struck by the sheer scale of everything in Italy. The variety of police forces (three of them, rivals yet not competitors, even four according to some calculations), the number of killings (Italians murder each other without cease, and preferably without motive), the hordes of unemployed day-laborers in village squares, the immense and unremitting uproar thanks to which the foreign visitor in Florence, in Genoa, in Milan, might just as well not waste his time trying to grab any sleep, day or night. The prodigious quantity of litter and empty bottles enhancing the natural beauty of the landscape, on the beaches, in the fields, all over the hills. Further peculiarities: if a train arrives at a station less than twenty minutes behind schedule; if a letter reaches its destination within three days of being posted, all who are party to the miracle cross themselves ‘just like we do when a calf is born with two heads’. These amusing snapshots of a time past, besides being entertaining, underscore the novella’s surprisingly moving themes around mortality, obscurity, the nature of freedom, one’s relationship with history. Having escaped the confines of high office, however temporarily, the King cannot escape being reminded of his approaching end, not least by the print near his bed in the Hotel Adler, the Stufenaltar des Mannes, depicting the stages of life from infancy to decrepitude. Part of the charm and poignancy of Divertimento 1889, however, comes from its subversive reminder that death is the most democratic of institutions and from its linking the King’s fate to the imminent demise of an entire era, a world on the verge of disappearing, swept up by “the frenetic tempo of modern life, particularly as embodied in its all-consuming technology, such as the telegraph (and soon we shall have the telephone), electric lighting, the giddy speed of the railway train.” The “March of Progress” represents “the twilight hour” for monarchies, “the long evening shadows….beginning to close in…the climacteric.” As the King recognizes, a greater threat to him than radicalism or socialism is anachronism. It will come as no surprise to you when I say I'd never heard of Morselli, but this little book sounds rather captivating. I love the idea of the King going off on a clandestine escapade. The quotes are great, especially the one on the impressions of Italy! Is it out of print? I guess second-hand copies might be available. Jacqui - the book does appear to be out of print but copies are readily available on the cheap (I picked mine off the shelf of a second-hand bookshop for $3 U.S.). I loved this little novel, and the author's manner of trying to "divert" his readers from seeing it as something quite more than it appears to be. Like Jacqui I also had never heard of Morselli before but the book sounds like a worthy read. Some of the themes that you mention, in terms of escape, its implications and limitations remind me of the ideas explored in Michael Chabon’s The Amazing Adventures of Kavalier & Clay. Brian - Definitely "a worthy read" - at least I found it so. I have not read the Chabon at all (despite his being a local author), but that's the novel of his that sounds most interesting to me. Not to be flippant but that cover is spectacular. I'll join the chorus of people who've never heard of this author. Guy - Not flippant at all, your comment about the cover, as it helped sell me on the book in the first place (I owe so many great reading experiences to cover artists...). It's also one of those covers that seems to fit the tone the work unusually well. Just based on this one book alone, I'd say Morselli deserves to be far better known. It's one of the best short novellas I've read in a long time. Very curious. This books seems to be the only Morselli in English. There's at least one other in English: the alternate historical novel I mention above, entitled (in English) Past Conditional. Also, I just stumbled on the most recent Chicago Review, which is devoted to Italian writers and features an excerpt from Morselli's novel Il comunista (The Communist), which is funny enough to make me hope the translator is working on the rest of it for publication. I never heard of this author; thanks for the review, Scott. Thanks for the comment, Miguel. Definitely a writer I'm delighted to have discovered. Another book for the wish list, which reminds me of how I will not get to read more than a fraction of all the books I want to read, or even of those I own. Guess I'll just have to savour the ones I do get to read, one by one. The eternal problem, isn't it? But how fortunate to have such an infinity of riches from which to choose!